I have recently bought a Huawaei MeidaPad M5 with 32GB internal memory. I am thinking of purchasing an Exeternal Micro SD card, say 128Gb and make that as main/default/internal storage. I have read on many forums the process to do this but they are all talking about Android 9. How would I do it on Android 8? So, what happens when I insert a new external SD card. Do I come to these settings and simply tick/select SD card as Default location for Storage? What will happen afterwards? Will I be able to move my apps on to the new SD card or would I need to uninstall them from their current location of the internal storage and re-install them on the now new defalt storage, i.e. the external SD card? I would really, really appreciate your inputs and guidance on how to complete this procedure. Short answer is 'you can't'. 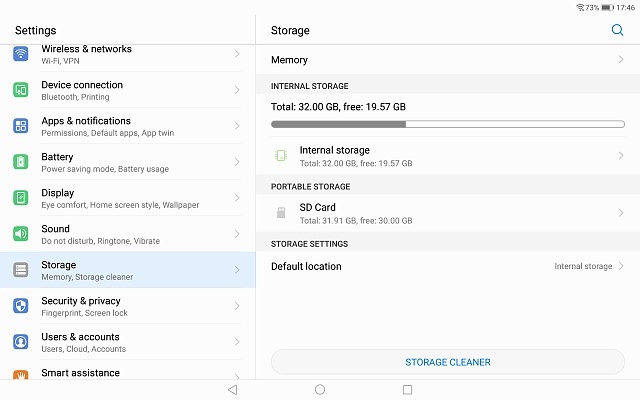 Your device doesn't support 'Adoptable Storage' (which is what Android needs now to make the device 'adopt' the SD card into the main memory, which also involves encrypting the card and locking it to that specific device). In your case, the SD card will work to save external downloads and media files, but I strongly suggest you avoid saving files you haven't backed up elsewhere (don't save camera pictures to SD card...just read the myriad of posts in these forums with cards going bad and people who didn't back up lost their precious moments). As for apps, it's up to each dev to decide what, if any, can be saved to SD cards. Some allow a portion of the app to be moved, some allow extra assets (music, images, etc. ), some game saves, etc. BUT the main app portion will ALWAYS reside in internal memory. That's just how Android works. You can, by rooting and hacking, trick the phone into thinking the SD card is a part of the internal memory, but I'm not versed on how to do that (and I REALLY don't recommend you doing that because chances are your card will fail). Thank you very much for your prompt response SpookdDroid. I am just wondering why the operating system is giving me the option to select either the internal drive or the external drive to make it as the Default Storage. From what I have read, this is possible with Android 9.0, but I am on Android 8.0. I do, however, back up my phones and now tablet on a regular basis and I have always had my camera pictures and music files on the external card on any phone I have had, Samsung, HTC and now Huawei. I do understand that the internal drive is meant to be the main storage, but why give us the option on Android 8.0 to change the default storage to either internal or external drive? I am aware after Marshmallow Android stopped the facility to move apps to the external drive. I was hoping after converting my default storage into the external SD card, that I would be able to re-install the apps and it would automatically reside in the SD card rather than the internal one. Anyway, thank you very much once again for your swift response. I would still appreciate further comments from people who have done this conversion with success. Where exactly are you getting that option? You might be looking at a specific app's default saving storage (like camera pictures or music downloads) and not at the system level. No. I am not. I have that option on both my Huawei phone and MediaPad M5. It is part of the Operating System and it clearly indicates that the default storage can be changed. I will try and attach screen shots. Both my phone and recently-acquired tablet have got that function/option under Settings. It would be very interesting to find out how it would work. 'Storage' for me means where things are stored, kept, downloaded to i.e. whether it is the external SD card or the internal card. I am not too worried about my phone as it has 64Gb internal and another32Gb external. But the tablet, I would like to have more capacity. I hope the Huawei veterans can chime in here and give me their thoughts. The choice simply means the device will save new downloads/pictures/some app data to the sd card by default. It does NOT mean primary storage for the device. In my opinion "adoptable" storage is a big mistake to make. while relatively rare, sd cards do fail sometimes. It's not only that they "fail sometimes". Android apps have to constantly keep their current state. That's because Android can kill any background app (one not showing on the screen at the moment, and not producing audio at the moment) at any time without notice. (Unlike Windows, which asks each running app if it can be killed, which is why you get that notice of which programs are keeping Windows from rebooting.) If the app is installed to the SD card, the card is constantly being written to by the app. An SD card's lifetime is measured in write cycles (unlike the internal storage, eMMC, a totally different technology). So installing an app on an SD card virtually guarantees early SD card failure. Sony doesn't make good decisions in my opinion, but not implementing adoptable storage happens to be one of the few good ones they made. On previous Android operating systems, there has been the option of moving apps to the external Sd card. I have done so with my previous tablet and phones and things have been going fine all these years. Why then give the option to move apps to the external SD card? I do appreciate not all apps are movable to the external SD card.... I am just wodnering why this phone or Android 8.0 is offering that option? Is this unique to Huawei or is that option part of Android 8? I appreciate all your inputs guys, but I just can't seem to understand why being given that option to change the default storage would be there if it was 'unworkable'? May be a phone call to the Huawei tech support (if they have such a dept in their HQ which is in the same town as mine) will be able to shed some light on this...... Who knows? On previous Android operating systems, there has been the option of moving apps to the external Sd card. 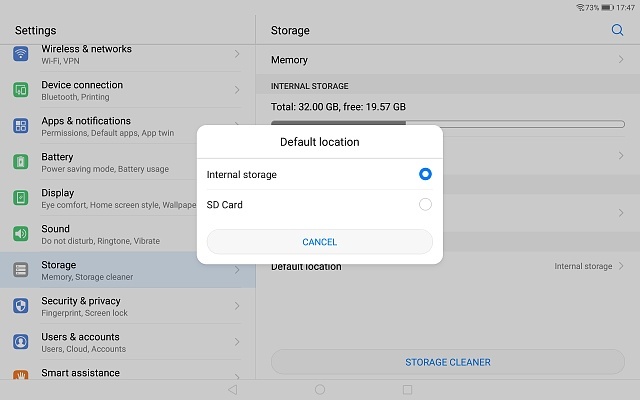 On even earlier versions, Google used to warn us to not move apps to the SD card because some apps, notably all widgets, wouldn't run from the SD card. I guess they got tired preaching to a brick wall - no one listened, then complained when a moved app stopped working. (And still complain when a moved app is updated and "gets moved back". Why then give the option to move apps to the external SD card? Google doesn't sell SD cards, so if the card fails, you're not going to complain to them. As far as adding the ability to Android, they regularly add something that an app was written to do into Android as a native function. I do appreciate not all apps are movable to the external SD card.... I am just wodnering why this phone or Android 8.0 is offering that option? Is this unique to Huawei or is that option part of Android 8? The default download location isn't the same as the default installation location. When you download an app, you're downloading a zxip file (renamed to apk, but it's a zip) of stuff needed to install the app. then the Package Installer installs the app - to internal storage, even if the apk file downloaded to the SD card. Why? If you have limited storage, you may not have enough free space for both the apk file and installation of the app. Downloading the apk file to the card frees up some internal storage.